Versatile Opera Star, Director, Teacher Regina Resnik Dies at 90 : Deceptive Cadence An American singer began her long career as a soprano in her home country, then thrived as a mezzo in Europe. She also directed opera and documentary film, working with both her husband and son. She died in her native New York. 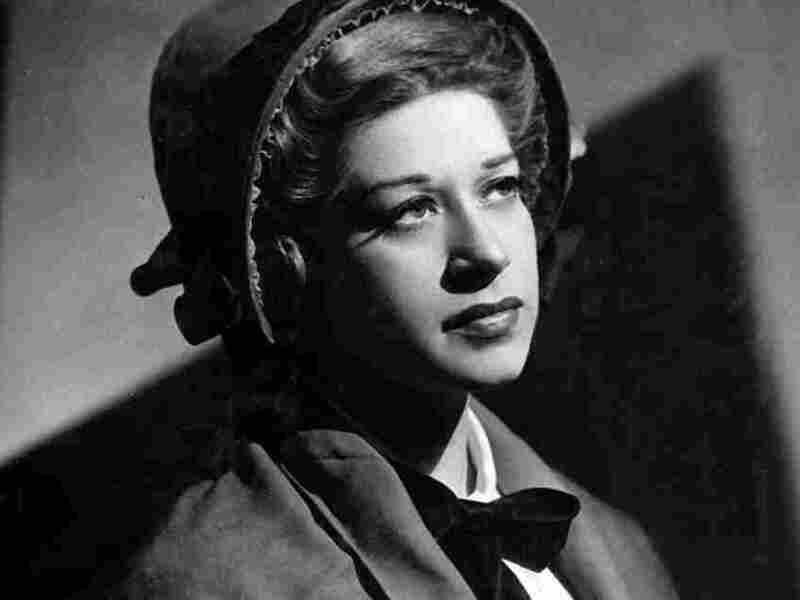 Regina Resnik as Ellen Orford in the Metropolitan Opera premiere of Benjamin Britten's Peter Grimes in 1948. The American mezzo-soprano Regina Resnik, known for her powerful voice and versatility on and off the opera stage, died peacefully in a New York hospital Thursday night, according to Amy Sperling, a longtime colleague and personal friend. Resnik was 90. Born in the Bronx in 1922, Resnik debuted as Verdi's Lady Macbeth with the New Opera Company in New York less than a year after graduating from Hunter College. Her long career at the Metropolitan Opera began in 1944 after she won the Met Opera Auditions of the Air and was soon asked, with 24 hours notice, to replace an ailing Zinka Milanov in a Met production of Verdi's Il trovatore. Resnik's career was a success from the start. In the space of 10 days after her Met debut, she showed unusual stamina and range as a dramatic soprano by also singing Santuzza in Cavalleria Rusticana and the lead role in Verdi's Aida. Irving Kolodin, in his Story of the Metropolitan Opera, described her voice around this time as "large and luminous." But in 1955 Resnik's career took a significant turn. Her dark, dramatic soprano voice was shifting. Completely rethinking her approach, Resnik embarked on a year-long period of study with retired baritone Giuseppe Danise, who helped reshape the opera star as a mezzo-soprano. Much loved in Europe after the switch, singing such high profile roles as the Prioress in the first London production of Poulenc's Dialogues of the Carmelites and Bizet's Carmen, Resnik's saw her career at the Met cool off. In his book the American Opera Singer, Peter G. Davis blames bad Met management. Resnik might have become the Met's preferred Carmen after [Risë] Stevens gave up the role — and her tough-as-nails, thinking man's Gypsy did offer a refreshing alternative to Stevens' glamour — but [general manager Rudolph] Bing gave her few opportunities to prove herself in the part. More "character roles" were offered, and only a handful of the leading parts Resnik had sung in Europe with so much distinction. Resnik never regretted her conversion to the lower register. "When I switched to mezzo," she told Bruce Duffy in an interview, "the gamut of the great parts as well as the great leading roles was so enormous there was just no question about the interest as an actress." Opera critic John Steane, in his book The Grand Tradition, calls her Ulrica (in Verdi's Un ballo en maschera) the finest in his memory and her Carmen from the early 1960s as "richly creamy in tone." A list of Resnik's roles, as both a soprano and mezzo-soprano, is extraordinarily wide, covering nearly all of the standard repertoire and beyond. Resnik's career also flourished beyond the opera stage. With her husband Arbit Blatas as scenic designer, she directed productions of Carmen, Falstaff, The Queen of Spades and Elektra in the 1970s. She also transitioned to Broadway, singing in Cabaret (earning a Tony Award nomination) and in Sondheim's A Little Night Music. Resnik also co-produced and narrated the documentary film Geto: The Historic Ghetto of Venice, working with her son, Michael Philip Davis, who was at her side at the time of her death, and who also confirmed her death to NPR. With a huge and resonant voice and keen instincts on stage, Resnik thought of opera as a physically demanding sport. "When I say 'sport' I don't even mean it in a lighthearted way," she told Duffy. "What we opera singers have accomplished in our lives — when I look back on 40 years of that kind of singing — is a very big tour de force. When you are at your maximum strength in opera, if you're doing an opera like Die Frau ohne Schatten, there's nothing to compare it to except perhaps an endurance contest in the Olympics."